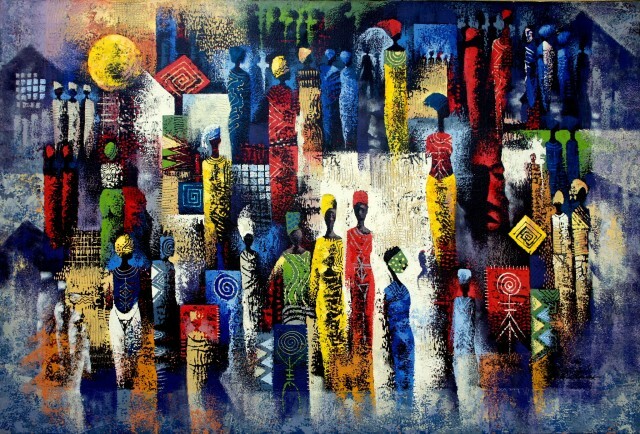 The Gallery of African Art (GAFRA) is pleased to present Transcultural Expression - a solo exhibition of early and recent paintings by the Ghanaian artist popularly known as Wiz Kudowor. The title Transcultural Expression is a reference to the myriad of cultures that have informed an artistic practice which spans over 30 years. Inspired by the traditional symbols and motifs of his Ghanaian heritage and inspirations from his travels, some elements of Wiz’s paintings are reminiscent of Cubism and Futurism. Wiz Kudowor’s paintings are instantly recognisable; his bold use of colour, abstracted figures and landscapes, as well as the interplay of geometric forms, are all signature elements in his work. Wiz describes his canvases as a place where ‘symbols play and jostle for space, forms relate and interact, colours clash, complement and harmonize with each other to give an overall view that cries for attention.’ Alongside the more vibrant and expressive paintings by Wiz, the exhibition also features works more tonal in nature such as Transitory Pursuits II (2015). African folklore, mythology, history, religion and philosophy are themes which have inspired much of Wiz’s paintings. In the work Ananse’s Tales (2014), he references the famous folktale character Kweku Ananse – the half-man, half-spider mythical figure featured in stories known throughout West Africa, the Caribbean and parts of the US. The use of Adinkra - visual symbols that represent popular proverbs and maxims - take centre stage in his Adinkra Panel series of works which are featured in the catalogue. Believed to originate from the Akan people, Adinkra symbols are used as decorative motifs on fabrics and pottery.